My illustrious alter-ego and I had a customer request for the return of our "Midsummer Night's Dream" colorway, but due to a miscalculation (Really I just put the pegs in the wrong holes on my skein winder :-) I wound this entire batch of thread at 40 yards per skein, instead of the standard 50. So, this batch is currently in the shop, and is priced at a discount to reflect the shorter skein length. I have sizes 10,20,and 40 in this color, as well as a few color collections with coordinating colors. Tatted intricate lace with iolit balls. Made of polyester yarn in a slightly shiny silver color. 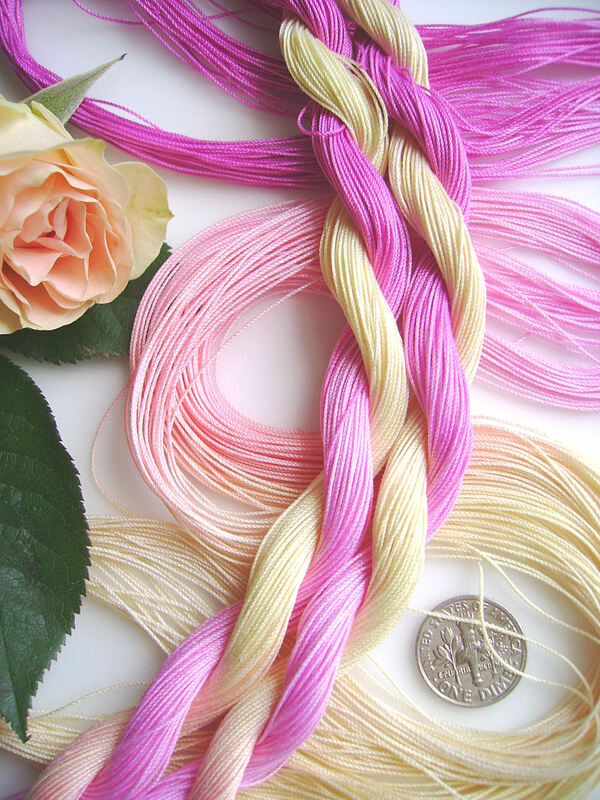 The thread is very stiff, and the technique of earrings finish ensures durability and stiffness as if it was wire. Length of earrings is 4.4 cm. Click the above picture to find my Spanish Dancer earring pattern, available in my etsy shop! Brooch entirely made of tatted elements. It consists of three layers: two black and one cotton-middle-of metallized threads. Gently shimmers and looks like sprinkled with glitter. Decorated with freshwater pearls. From the bottom there hang cascades of chains and pearls. Absolutely unique decoration. Diameter of brooch is approximately 10 cm. Purple to deep pink, inspired by a purple variety of Morning Glory flower which refused to show its true colors in photos...but the hand dyed thread looks good! Introducing the latest hand dyed thread available from Dr. Vonthreadmore's laboratory, available in Lizbeth 10,20,40, and 80! Color collections in sizes 10 and 20 also available. 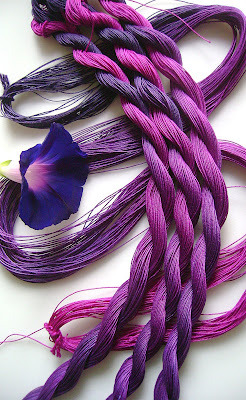 The previous batch of "Knitty Gritty" hand dyed thread sold out very quickly, so I have dyed some more. I present delicate earrings. Perfect for a cream wedding dress. 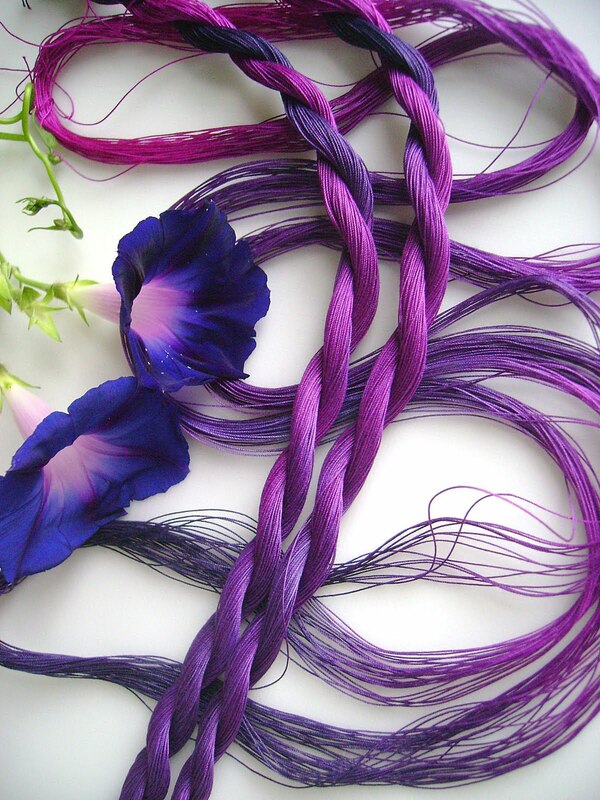 Tatted flower is made of two rows of lace. Crystals have silvery creamy reflections. Thread is cream. Tatted elements are rigid. Entire length of earrings is 4.6 cm. I have been tatting for 7 years and making jewelry for 5 years. A year ago I decided to combine these two crafts and make tatted jewelry. I use my designs in tatted earrings, bracelets and necklaces. My tattings are very tiny and rigid, because of use of fine matallic threads. I like exclusive and elegant look so my jewerly is made from silver and minerals. "Peace", "Berry Intense", and what on earth is a "yarnplayer"? 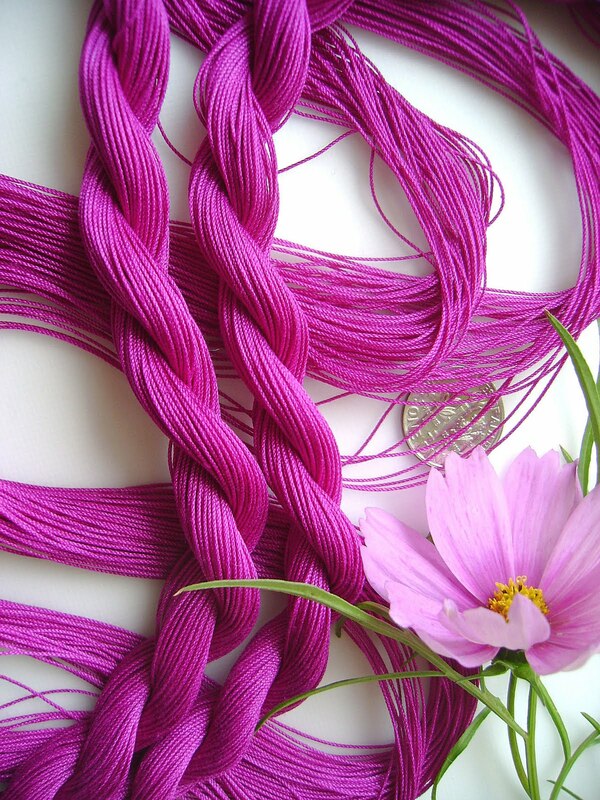 Hi all, yarnplayer here. The "yarn" part means I've always been interested in yarn crafts of all sorts. The "player" part can mean that I like playing with yarn, but it also means that in my spare time I play the cello. Hence, the cello player in my profile picture. Which, by the way, is an original handwoven tapestry that I wove myself, from my own handspun yarn. I've been tatting over 30 years. 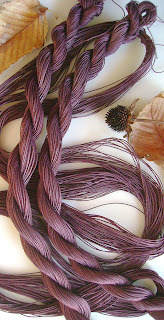 I began hand dyeing thread for tatting in 2007, using the technique I learned at a dyeing workshop given by the local handweaver's guild. 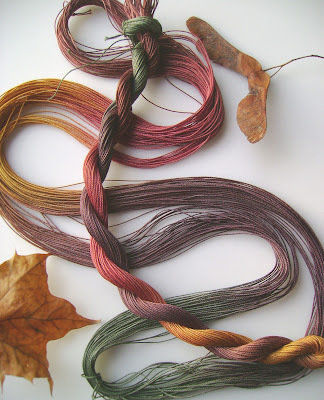 It occurred to me at the time, that tatters would enjoy hand dyed thread as much as weavers and knitters enjoy hand dyed yarn. I hand paint small batches, and I'm always experimenting with color. I DO NOT do custom orders, for a number of reasons. So, please enjoy choosing from what is in my Etsy shop, the selection is always changing. I also design for tatting. Mainly jewelry, but I've designed a few doilies and other things, too. I've self published 2 books. Have fun with your tatting!